Sunspot AR2526 is big enough to swallow our entire planet–twice–and today it is crossing the center of the solar disk, directly facing Earth. Amateur astronomer J. P. Brahic took advantage of the crossing to photograph the behemoth from his backyard observatory in Uzès, France. 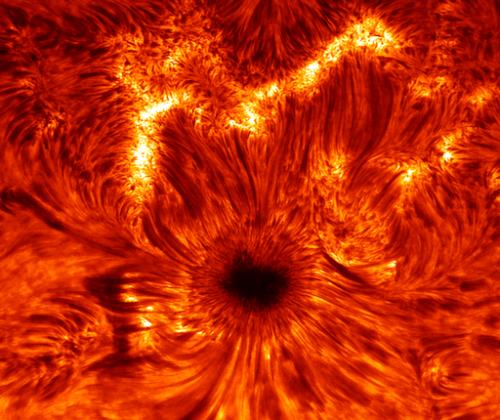 Surrounded by a maelstrom of swirling red-hot plasma, the sunspot’s dark core looks menacing indeed. But looks can be deceiving. In fact, sunspot AR2526 is one of the least threatening sunspots to come along this year. AR2526 has a stable magnetic field that resists exploding. As a result, NOAA forecasters say there is no more than a 1% chance of a strong solar flare for the next three days.